The eight-day festival of Passover is fast approaching. This year Passover is April 3-11. It commemorates the emancipation of the Israelites from slavery in ancient Egypt. For more info on Passover and its implications for kosher standards, please refer to the “OK Kosher Plant Manual” page 84. 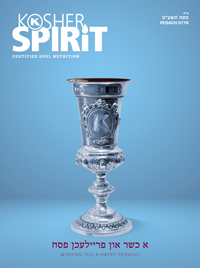 The Manual is available on your Digital Kosher homepage, or contact your Account Rep if you would like to receive a hard copy. Also, please note our upcoming Passover holiday closing schedule! We encourage customers to notify us of any urgent requests as much in advance as possible, so we can make sure to service your request promptly. New ingredient / product submissions that are urgently due. Productions that will require the scheduling of your local rabbinic representative during the holiday season. ISOtank and bulk shipment requests that are urgently due. We always appreciate your support and understanding. We focus on providing you with the finest service.